During one weekend, my gal told us that she wanted to have lunch while we were @ town. And she specifies that she wants to have some "Chu Char". 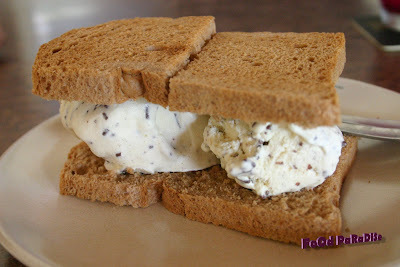 Hubby has no idea where to have lunch around 1.30pm in the afternoon. As usually most of the place will wrap up their lunch hours in 30 minutes or so. Then suddenly...... 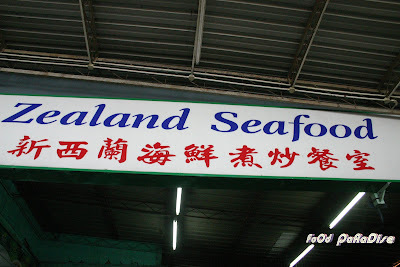 I recall this shop ~ 西公园 @ Transfer Road, Penang. 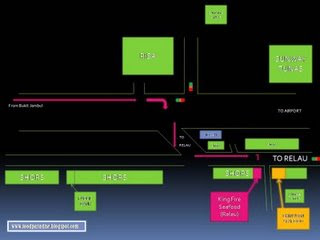 For Map Location, please click here. I never dine there before but hubby went there with my MIL for their fried rice before and told me that it tastes very delicious. My MIL also told me that it has the "Wok Hei". 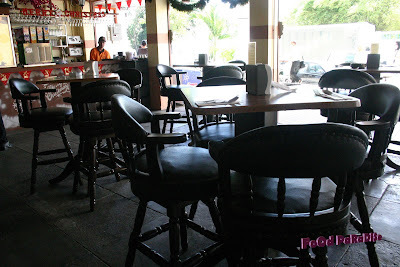 So since my gal wants to have chu char we decided to go there as the shop operates from 11am till late. The uncle was telling us. 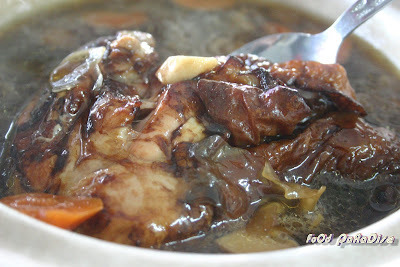 The cabbage soup "Ho Chiak". Kids will loves it. So we settle with the cabbage soup and the uncle is right. The soup tastes nice and sweet. My gal loves it very much and I lose count how many bowl of soup she gobbles up. 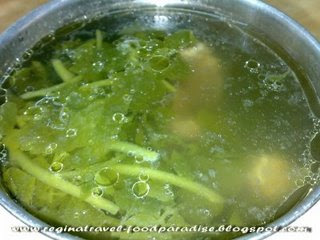 ^o^ And there are many ingredients in the soup as well. Uncle also recommended this for my gal...... so we ordered this and give it a try. 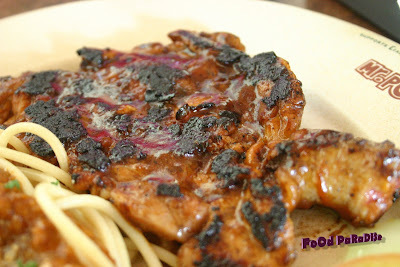 The pork is very thinly slices and tastes nice but hubby and I found it a bit salty to our liking. 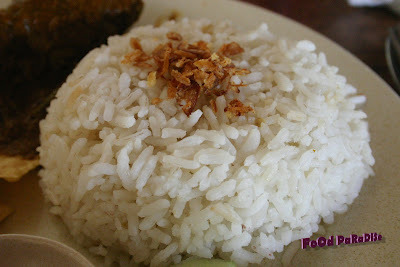 It is best to go with some white rice. Hubby asked uncle whether there are any egg dishes? And uncle told us Fu Yong Omelette's. 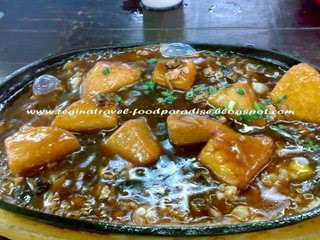 The Fu Yong Omelette's is very fragrant. It has a very nice aroma and it tastes nice but also a bit salty to our liking. 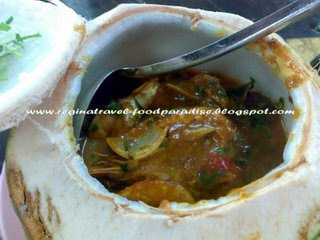 The last dish is the assam prawn and it tastes very nice and fresh. Overall..... everyone of us is enjoying the meal there. And the price is very reasonable. There are two stalls selling belachan bean curd. 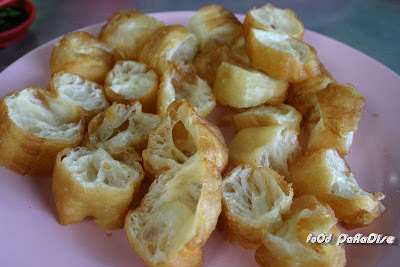 And I am eyeing for another stall deep fried belachan bean curd as I personally think that it looks more delicious compare to this. But hubby went and ordered it from the other stall as I did not mentioned which stall to order. ^o^ The bean curd tastes alright but it does not have strong aroma of belachan on it. 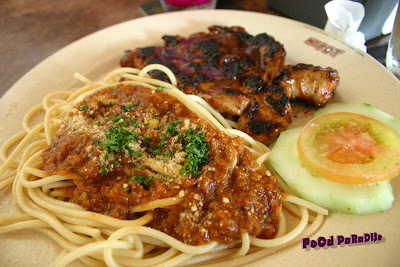 Overall, their bee hoon thn'g tastes alright. My gal ordering Chee Cheong Fun but ends up hubby finished it as my gal told me that she doesn't like it but my hubby told me that it tastes not bad. Hubby also ordered this for me to try. Don't panic when you see the colour of the tom yam. It does not tastes as spicy as it look. 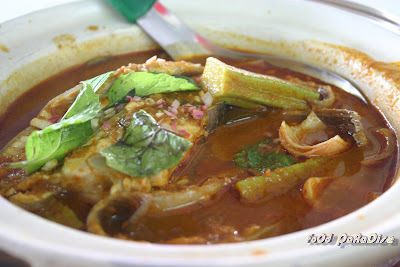 When it is being served, hubby told me this must be very spicy but after I tried it is not spicy at all. Even my gal helps herself with this tom yam bee hoon soup. 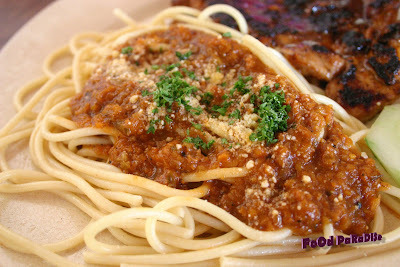 Location: 827A, MK13, Relau, 11900 Penang. 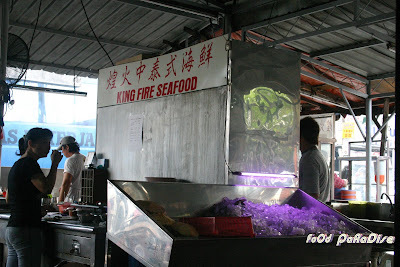 There are lots to offer beside the chu char @ King Fire Seafood Restaurant. 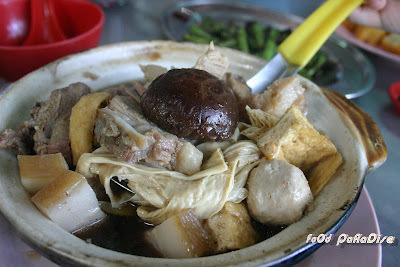 There are also Bah Kut Teh, Satay, Fish Head Bee Hoon soup. There are lots of herbs aroma in the curry. 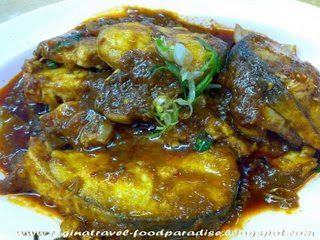 The curry tastes very nice and the fish are very fresh. My gal enjoys the curry too. As she found that she still can handle the spicy from this curry. 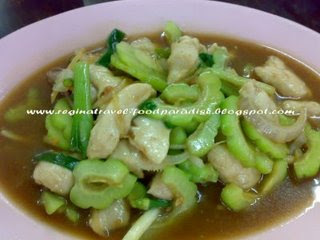 The chicken is very tender and succulent. 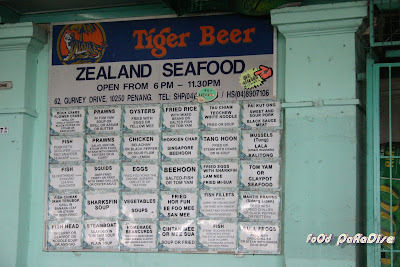 Overall.... the foods are tasty and it is very reasonably price. 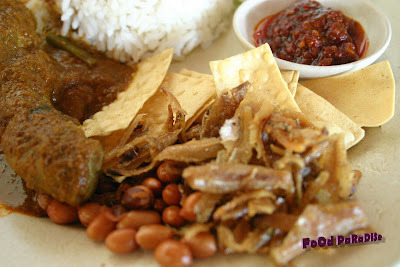 The total bill for the night is RM33.80 (including 3 rice). The serving is quite big too! 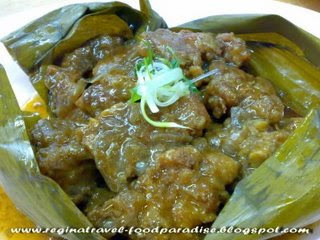 The spare ribs is very tender and melt in your mouth. Not Bad..... Should Try!!!! wow..... this is very nice. It is a bit spicy only. Even my gal try it and say it is very nice. Very nice soup. 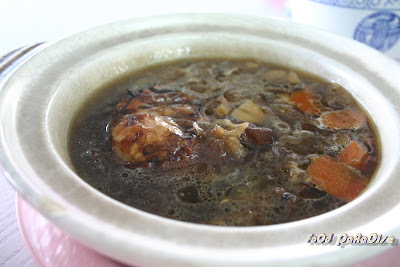 It's been a long time that we did not drank this soup and my gal drank many bowls. 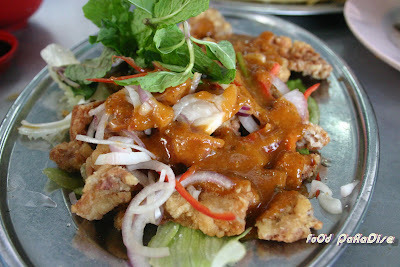 This satay stall sauce is very special. 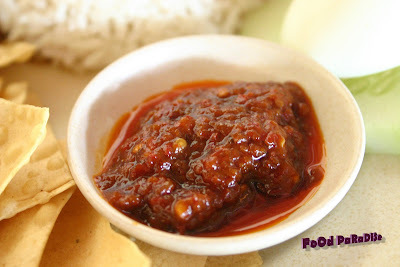 A bit like rojak sauce. And you have to put lime with it. So when you eat that you feel very refreshing. And it is quite cheap. 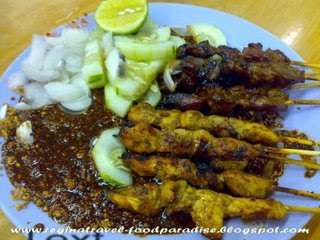 It cost RM5.00 for the above satay. This stall is located in the same restaurant. 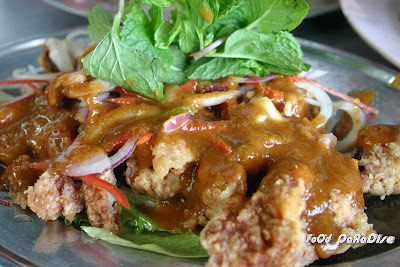 wow...... we were recommended to try this dish. It turn out to be nice. But if you does not like the herbs than you will not like it as it has a very strong aroma of herbs. 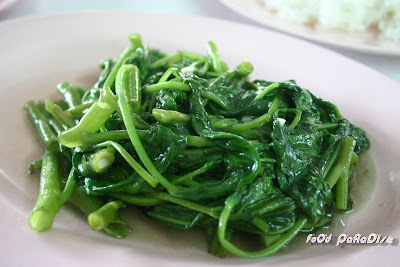 If you like otak - otak, then you will love this dish. Worth to try!!!! 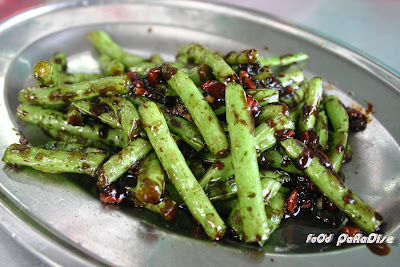 Overall..... this stall chu char taste nice and cheap too. During the last week of December 2008, we went to town for some shopping. By the time we arrived town, it was traffic jam all the ways. We were so hungry and just grab whatever that is fast and quick. And we saw Mr. Pot, and we went to try since we saw many floggers blog about it before. Location: No. 8 MWE Plaza, Lebuh Farquar, Georgetown, Penang. Hubby ordered this. By the time the drink arrive, my gal and I looked at each other. 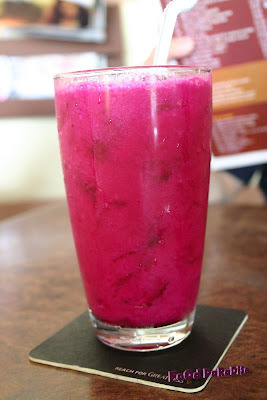 ^o^ It's red dragon fruit........ it is rich in vitamin though. Hubby had his first sip and out of surprised, he told us to try it as he claimed that it is very refreshing. And we tried some and found that it tastes nice and refreshing. 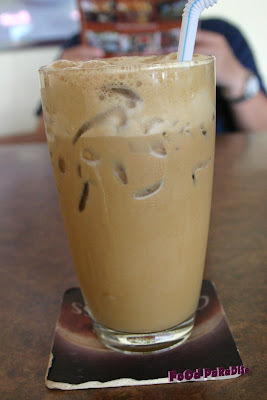 I had this and since it is a very hot day and this helps me to cool down and the ice cappuccino tastes ok but a bit sweet towards my liking. 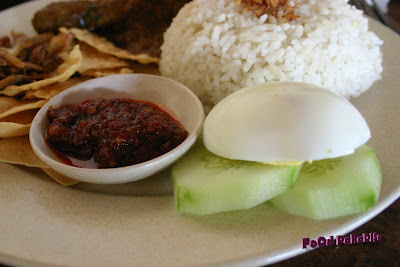 Well..... the nasi lemak tastes just so-so to me. 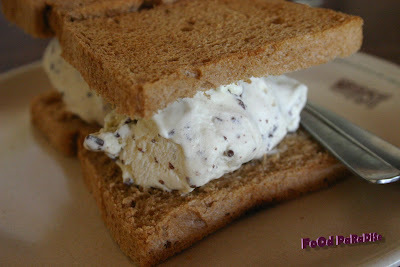 Hubby also ordered ice-cream toast to try. And it turns out to be great. Although it is a very simple things to do. 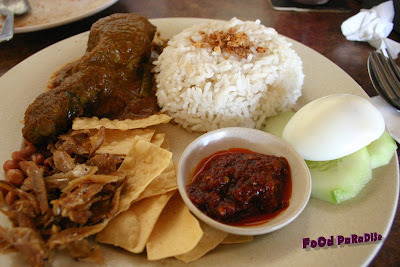 Our total bill for this lunch cost us RM40.90. 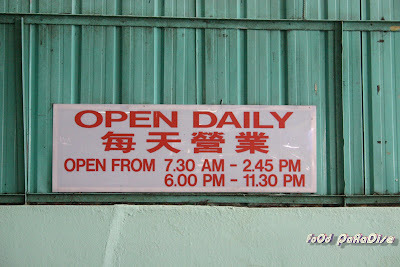 Location: 62 Gurney Drive 10250 Penang. 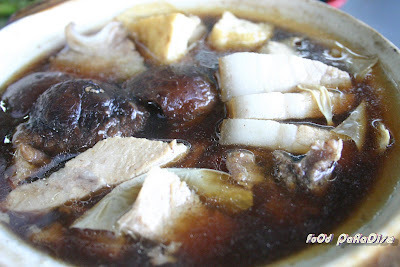 The Bah Kut Teh is dark in colour compares to the one in Song River Bah Kut Teh. My gal enjoy having the soup. 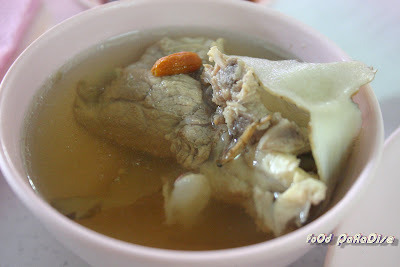 And half way through we were top up with more hot Bah Kut Teh soup. My gal is so happy and sip more and more. The pork is very tender. Hubby would like to order some chickens for our gal. And the person who took our order that told us it is only "little' spicy. 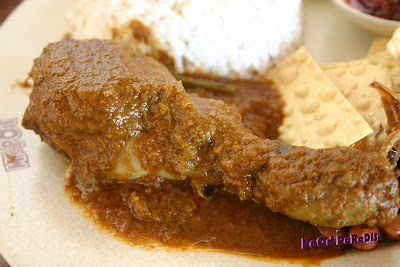 But when the chicken arrived, both hubby and my gal said it is very spicy for them. So I am the one have to finish all of it. 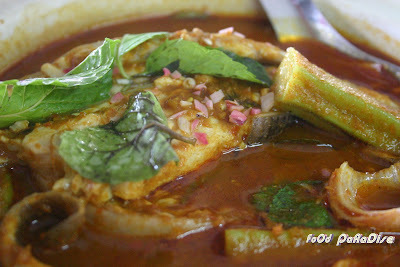 ^o^ For those who cannot take spicy food should omit this dish. 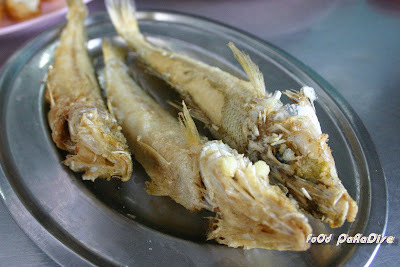 Hubby eyes went "BIG" when he heard that they have this deep fried fish. 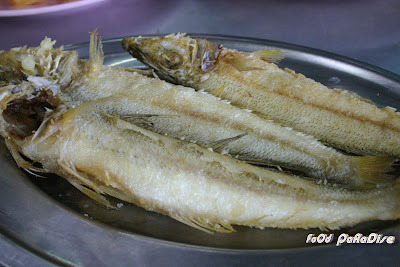 As it's been very long time that he did not eat this kind of fish. The reason being that I never prepare deep fried food in my kitchen. Unless some one do the deep fried job. So most of the time we get to eat deep fried stuff when we went back to my MIL place. 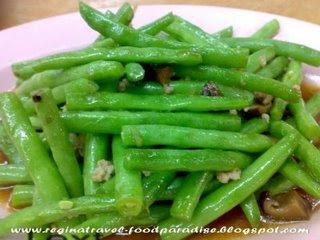 French beans again???? Yes.... my gal loves it very much. 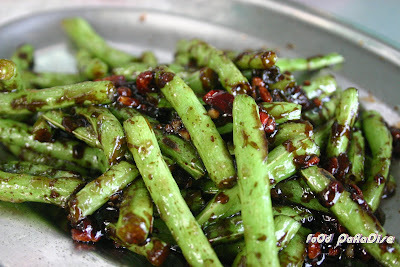 And it looks similar with the Song River Bah Kut Teh stir fry french beans, right? That's what we said when the order came in. Anyway.... it's equally delicious.